For initialize this plugin we have to just write new Dialogify() method, this method will initialize this plugin, here we have use this plugin with ajax, so in this this new Dialogify() method we have to add php script file, so when this plugin has been initialize then it will send request to php script for fetch data from mysql table. In second argument of new Dialogify() method we have to define different option like which data we want send with Ajax request, button property of modal dialog box etc. After define this things, now we want to set modal header title, for this we can use title() method, this method is used for set header title of modal dialog box. And lastly we have to write .showModal() method, this method will pop up Dialogify modal dialog box on web page with dynamic data. Below you can find complete source code of Loading of Dynamic content in Modal dialog box using jQuery Dialogify plugin with Ajax jquery. 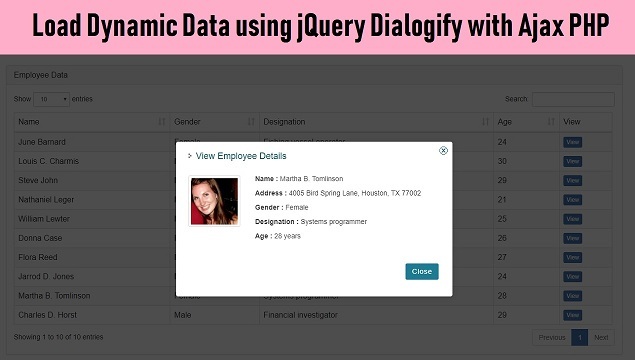 Above source code is a complete source with load data into jQuery Datatables plugin and view dynamic mysql data into jQuery Dialogigy plugin modal dialog box using Ajax PHP.